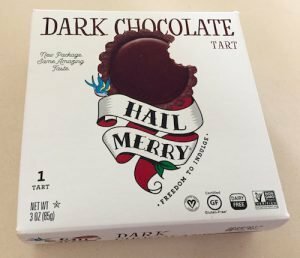 We loved the Hail Merry tart in Vanilla Coconut Creme … but we found Dark Chocolate to be even better, especially for chocolate lovers. This tart is pure decadence: rich, thick, creamy, perfect dark chocolate, with zero bitterness. And the chocolate cookie crust only adds to its all-chocolate, all-the-time goodness. 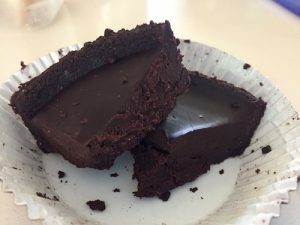 The tart is quite small, but because it’s so incredibly rich, it’s possible to turn this one serving into two or even four (though we certainly appreciate that the nutrition info lists this as one serving…is there anything worse than a fabulous vegan dessert whose serving size is tiny?). This is a dessert that would be lovely with some vanilla ice cream but is also just fine by itself. And it will surely impress omnivores as much as vegans.